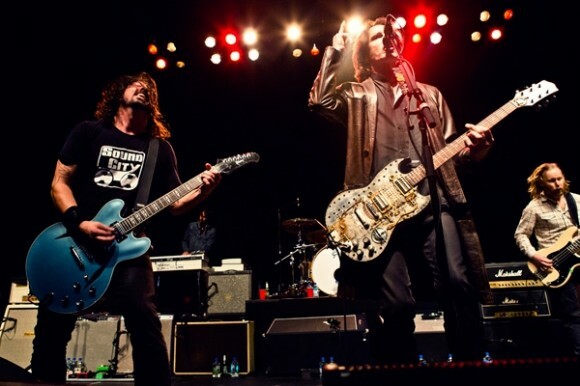 Dave Grohl’s Sound City Players rocked the Hollywood Palladium (January 31st) with a three and a half hour set with an all star cast, consisting of 38 songs and a chock full of rock n roll. Watch video clips of Stevie Nicks, John Fogerty, Corey Taylor and Lee Ving (all separately) with the Sound City Players below. The show followed the Los Angeles premiere of Sound City, Grohl’s directorial debut and film about the legendary Van Nuys, CA recording studio where a number of legendary albums were made. In attendance were many of the artists where their music was created and brought to life. The film debuted at the Sundance Film Festival in Park City, UT on January 19th with the Sound City Players performance there. 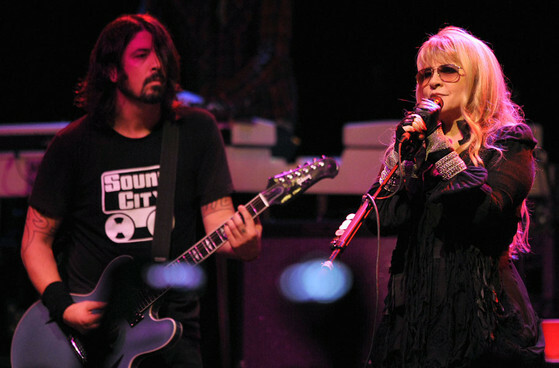 Joan Jett, Nikki Sixx (Motley Crue), Butch Vig (Garbage) and Tony Kanal (No Doubt) were amongst the famous faces in attendance, along with the people who took part at the Sound City Players show. Grohl’s band Foo Fighters played much of the set, who were also the backing band. Taking part amongst the famous names were Stevie Nicks (Fleetwood Mac), John Fogerty (Creedence Clearwater Revival), Brad Wilk (Rage Against The Machine), Rick Springfield, Corey Taylor (Slipknot/Stone Sour), Rick Nielsen (Cheap Trick), Krist Novoselic and Pat Smear (Nirvana), and Alain Johannes (Queens of the Stone Age). Many of the performers took part in the Sundance Film Festival performance appeared on the Los Angeles version as well. Splitting into sections, each guest musician played four songs, consisting of classic songs from Fleetwood Mac and Creedence Clearwater Revival. Fogerty performed numbers such as ‘Fortunate Son’ and ‘Born on the Bayou’. Nicks performed classic Fleetwood Mac tunes ‘Dreams’, ‘Landslide’, ‘Gold Dust Woman, ‘Stop Draggin My Heart Around’ (with Grohl singing Tom Petty’s parts) and soundtrack original ‘You Can’t Fix This’. Various songs from throughout the movie soundtrack, including Wilk and Chris Goss (Masters of Reality) doing ‘Time Slowing Down’ and Black Rebel Motorcycle Club with Grohl doing ‘Red Eyes and Tears’ and ‘Whatever Happened To My Rock and Roll’ were also included into the set. Rick Springfield and Nielsen performed songs they each respective made famous, with the Foo Fighters backing them. Springfield performed ‘Love Somebody’ and ‘Jessie’s Girl’, while Nielsen did Cheap Trick classics ‘Hello There,’ ‘Surrender’ and ‘Ain’t That A Shame’ with Taylor on vocals. Sound City is in theaters in select cities.